The game of chess has a long and far-reaching history. Generally regarded as originating in India in the 5th or 6th century A.D., it was first called Chaturanga. It replicated Indian army battles featuring horses, elephants, chariots and foot soldiers, but was mainly a game of chance. Mimicking the practices of defensive and offensive power that characterize wartime battles, the game of chess allows players to exercise the strategic parts of their mind. From India, it spread to the Persians, then Arabs, then to Europe in the 10th century where it was a game strictly played by the upper classes. When the Middle Ages hit and the age of the merchant classes dawned, chess became widely available to all members of society. Since then, numerous different types of chess sets depicting a variety of characters have been manufactured and made available to the public. Medieval chess sets are very popular as the political upheaval of the period provides excellent fodder for the game of strategy and forethought. 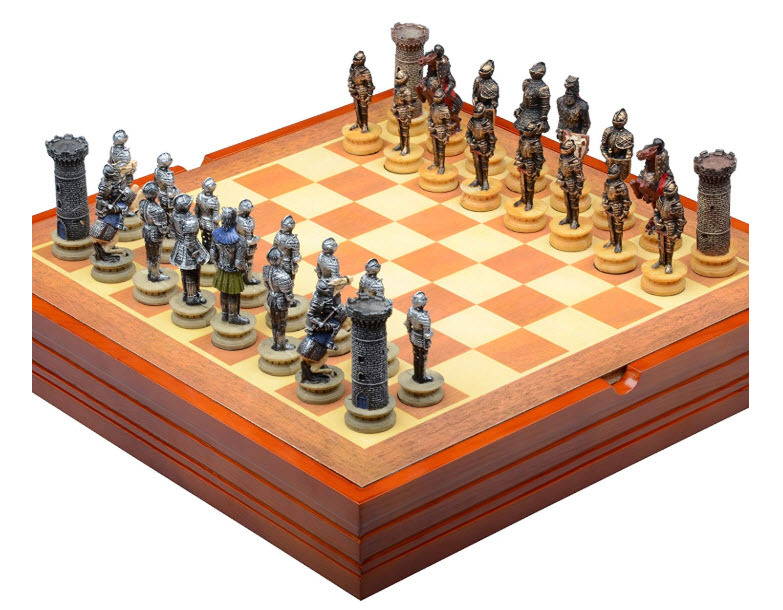 Below are some of the most popular choices of Medieval chess sets available. The Holy Crusades refers to a historical period marred by bloody religious battles. This period is replicated with the king, knights, and castles on the chess board. With the goal of defending your king from the threat of the opposition, players strategize and mentally role play the intense power struggles of the time period. The board’s bishops strive to push forward into the opponent’s territory with each and every calculated move. The chess figures feature the ultimate in craftsmanship as they are hand painted and made from durable and resilient resin. The red and white brings to mind the colours of the holy crusades, and the quality of the pieces and black and maple game board will provide entertainment for its users for years to come. The king’s height is 3 1/4″. Its base is 1″ and weighs 1.2 ozs. The set weights 28.4 ozs and features a single queen for each side. Scale is perfectly matched with 1.5″ board squares. The board comes with a total of 32 pieces and measures 15 1/4″. 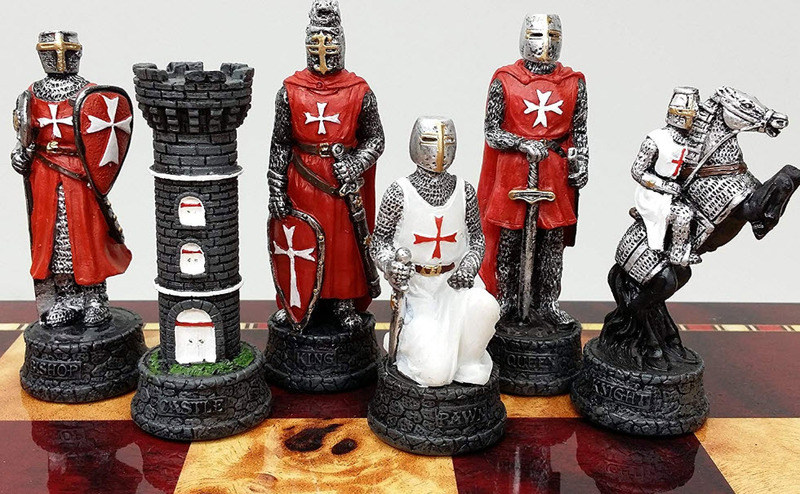 This Crusades chess set would be ideal for chess and history enthusiasts alike. Encouraging the union of the imagination, history and chess, this Medieval metal crusades chess set and board is a piece of art and a thrill to play. The chess board is raised to replicate the turrets of a castle rooftop. The board compliments the crusade chess pieces which are heavily weighted for true presence and quality. The board’s pieces are hand painted to exquisite perfection in a variety of colours that perfectly depict the Christian knights facing their Saracen enemies. The pieces include the animals they relied upon for transport as the horse and camel are painted with equally-exquisite detail. 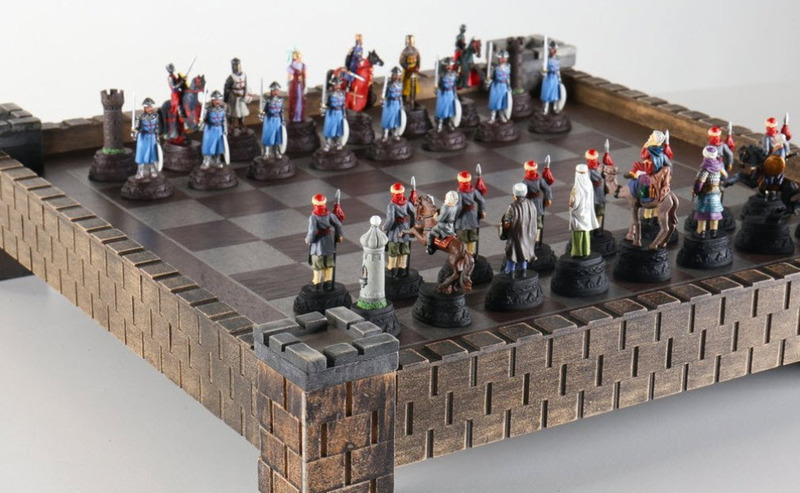 This is one of the most popular Medieval chess sets available. The board is one of the most appealing qualities of this set with its unique raised design; it measures 17 1/8″ and to the height of the turrets, it stands 3 5/8″ tall. The king measures 3″ tall and weighs 4.5 ozs. The additional pieces weigh 6 lbs, 2 ozs and are constructed from metal. 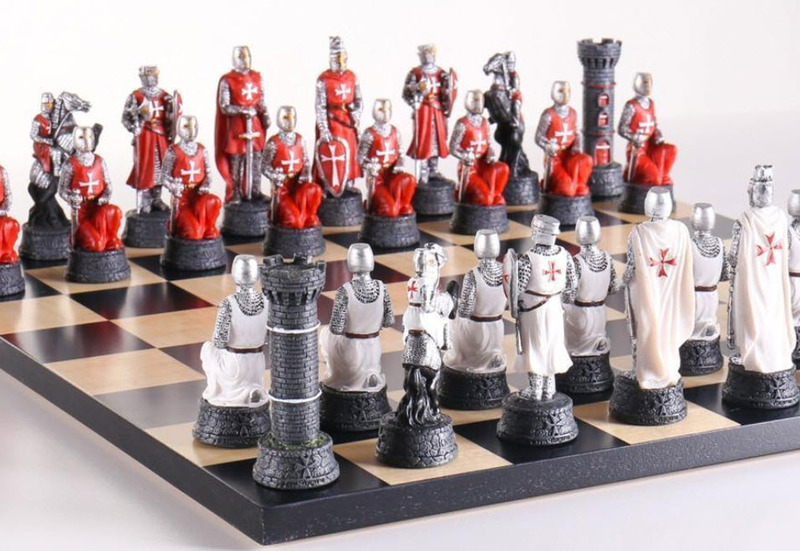 This Medieval times crusades knight chess set features the red and white crusaders. The knights are hand painted with the emblematic Maltese cross. The pieces feature exquisite detail from the ripples in their cloaks to the detailing on the swords and the chain-mail armour. The beauty and craftsmanship of the board and its pieces is evident by its decorative packaging. The beautiful box depicts a Medieval scene of chessmen, and the foam inlay provides the chessmen with the ultimate protection between games. The chessmen are constructed from solid resin and are hand painted with felt bottoms to smoothly manoeuvre around the board with ease. This set does not come with a board and features a 3 1/4″ king. The set comes with the standard 32 pieces, and its total weight is 1.75 lbs. This chessmen set would make the ultimate gift for someone with appreciation for exquisite detailing and craftsmanship. This Medieval knight chess set comes with a playing board with storage underneath. The 32 pieces are hand painted with intricate detail. The detailing on the pieces is very impressive as the armour, shields, and swords have impressive and historically-accurate details. The different colouring on the shields depicting the sigils is quite impressive. The pieces are painted with distinction in mind to encourage an easy playing experience. With the playing board functioning as a wooden box with storage underneath for the pieces, this chess set is ideal for those who travel or want to easily transport their chess set around. The wooden storage box is 14 1/4″ by 14 1/4″. The handy storage area makes up the underside of the storage box, and the actual surface for playing is 11 3/4″ by 11 3/4″. All 32 chess pieces are made out of durable and resilient resin for longevity. The quality of craftsmanship is evident throughout this chess set with wooden storage box by DesignCovers. This set makes the idea gift for the true chess aficionado that would enjoy the benefit of being able to tote it around easily. There are a number of Medieval chess set brands to choose from, and one known for its decadence and supreme craftsmanship is the House of Staunton. Meticulously hand painted, the House of Staunton medieval Crusades chess pieces depicts the bloody conflicts that raged between the Christians and the Muslims led by Saladin. The period most often epitomized in Medieval chess set refers to the era between 1095 and 1292 during which time Saladin sought control over Jerusalem. Specializing in wood chess sets, the House of Staunton name is synonymous with superior craftsmanship and attention to detail. The Regency Chess Company is known as fine purveyors of world-class chess sets. From metal to plastic and resin, Regency chess sets offer a wide variety of high-quality sets to suit every player and budget. Regency Chess has earned the title of UK’s most successful chess retailer. Shoppers of Regency can purchase boards, chessmen, sets, chess bags, chess cases, and chess clocks. Design Toscano medieval chess set features resin knights embroiled in mortal combat. Design Toscano artisans paint every piece by hand to the highest standards of intricacy and perfection. The chess pieces are most often depicted in silver and gold and include intricate details from the billowing capes to the exquisite swords and shields. The medieval times crusades chess pieces crafted by HPL are known for the depiction of the infamous Maltese cross. They are vividly painted in white, red, and black. As they specialize in the pieces rather than the boards, HPL crusaders are 100-percent authentic looking from the chinks of the chain mail to the detailing of the swords and shields. When it comes time to purchase your chess set, spend some time thinking of the material you want the pieces made out of and if you are buying a complete set of the board and pieces, or just the pieces and a playing surface separately; in that case, you will want to ensure that your chess pieces are to scale with the squares on the board. Chess sets come in a wide variety of prices, depending on brand, craftsmanship, and material. Chess boards and pieces can be made of plastic, wood, resin, metal, and even marble. Wood, plastic, and metal are generally less expensive, but again, that depends on the brand and craftsmanship. For a high-quality resin or marble set, prices can start at $100 and go up from there. For a lovely HPL crusaders set, you are looking at between $200 and $300. For an average starter set made from plastic or metal, you can find them for as low as $30. If you are wanting to invest in a piece that is as much a piece of art as it is a game of strategy, wood, resin, and marble sets can be bought for up to as much as $1,000. 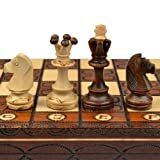 When it comes time to shop for your chess set, there are numerous online sources where you can sift through the selection at your leisure and read through customer reviews to see what will best suit your needs. The House of Staunton and The Regency Chess Company service a world-wide clientele. If you are looking for a piece of superior craftsmanship, perusing one of these sites or paying a visit to your local game and hobby store will likely feature a number of impressive chess board sets. Chess is a game of strategy, and what better time period to stage an epic board battle in than medieval times. Take part in an ancient game of strategy with the beloved medieval characters of the king and queen, bishops, knights, saracen warriors, Saladin, Richard the Lionheart, any many more. Whether for a gift or a treat for yourself, medieval chess sets represent the perfect union of artistry, history, imagination, and strategy.